As I mentioned in a previous post in February, my family is actively involved on the launch team of a new church called Collective MKE. The journey has been an interesting one in many ways. We're still in the throes of launch and while things are starting to take shape, there's still much work to be done. We have been gathering as a launch team three out of four Sundays a month in the house of a friend on the team. The fourth Sunday we gather as a larger body in a building in Waukesha that we rent for that worship service. At the home gatherings we talk a little about where things are going as a church, but lately we've been having a full service-like session. It features a couple of readings, lots of stimulating theological discussion and a simple communion. It is very much a house church that we are trying to grow into a bigger entity, eventually. How that manifests itself remains to be seen. At the moment, we are working on finding a meeting place so that we can have the larger corporate meetings weekly, instead of monthly. We're looking at renting a school or some local vacant spaces for a Sunday AM or PM service. It's been a challenge, but we're confident something appealing will come along. But more about the experience. While I'm sure a "home church" sounds weird, cultish and uncomfortable to most people, it's something I've come to embrace. In our small setting, we've gotten to know and become fairly tight with about 7 families. This includes over a dozen kids. We share struggles and accomplishments, joys and concerns. And in the process, we've come to look forward to "church" in a new way. It meets all of us where we're at. We help each other through stuff, we learn from one another and we laugh a whole lot too. It gives me everything I ever got from a large church, plus a whole lot more. 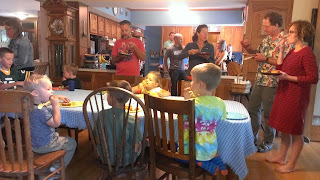 So as I sat there at the post church potluck this morning, with the rattle and hum of kids playing and eating and the adults laughing and conversing, I realized how lucky I was to have them all as new friends. I am one of those people who thought that church should be a place you go to for an hour and a half every Sunday, and anything less was not really church. I'm finding that it's not about a building, at all. The tag line for Collective MKE is "Because, together is better."